When is a motorhome windscreen chip beyond repair? We wrote previously about why it’s important to get a chipped windscreen repaired before it turns into a crack, but after receiving further information from our approved repairers Autoglass® we wanted to expand on the info provided and explain exactly what the difference is between a chip that can be repaired and one that can’t. 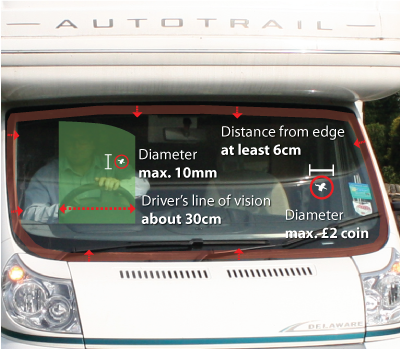 A motorhome windscreen is generally made up of 2 layers of glass with a laminate in between. If the windscreen is scratched but the laminate has not been damaged then the windscreen does not need repairing, as there is no threat of cracking, however Autoglass® are happy to polish out such scratches free of charge for Caravan Guard motorhome insurance policy holders. According to Autoglass®, if a chip is in the driver’s direct line of vision (roughly 30cm wide, as shown on the photo) the maximum diameter the chip can be for it to be repaired is 10mm, but if the chip is outside of this area then it can be up to the size of a £2 coin. In both cases the chip can be no less than 6cm from the edge of the windscreen. If the size of the chip is larger than the sizes mentioned then it cannot be repaired and a new motorhome windscreen would need to be fitted. It’s for this reason that it is vitally important to get a chip fixed quickly before it has time to spread into a crack that is beyond repair. It’s quicker and easier than a replacement. A repair takes less than 30 minutes, so even if you are about to go away with your motorhome it’s better to have the quick repair done, rather than dealing with the lengthier process of a replacement down the line. It’s better for the environment as less new windscreens need to be produced. Autoglass® have confirmed that anywhere in the EU that is covered by Caravan Guard is covered by their repair network, meaning even if you are on holiday on the continent and spot a chip you should give them a call and get it fixed before it turns into a bigger crack. Another important feature of the cover we provide through Autoglass® is that they have a specialist department who are experts in motorhome windscreen repairs, so you can be sure that the person you speak to understands the specific needs of different types of motorhomes and can advise on the best course of action. If you are unsure of whether your windscreen’s chip is repairable then call Autoglass® on 0800 413 044 from the UK, or 00 44 800 36 36 36 from outside the UK, and they will be able to advise you further. As a windscreen repair professional, I have to correct the advice from Autoglass regarding the distance from the edge of the windscreen. Autoglass may be unable to repair a chip that is closer to the edge than 6cm, but that does not mean it cannot be done. We can and do, on a regular basis repair chips within a few mms of the edge of the windscreen. As an independent windscreen chip repair company, we concentrate only on windscreen repairs rather than replacements. We aim to repair most chips in windscreens and aim to achieve a greater than 95% improvement of clarity. We will attempt a repair before advising a customer to replace the windscreen. Autoglass have a tight hold on the industry but you shouldn’t believe everything they say. I have a big American RV with two separate windscreens and the passenger side has a big crack. Will it pass an MOT? Been quoted £1700 for a replacement so I hope so. Does this cover as a far a field as travelling to Turkey? Richard, sorry for the delay in responding. I will post a full answer soon. Autoglass ® have 13 branches across Turkey providing coverage across most, if not all, of the country. If a customer needed a motorhome windscreen repair or replacement whilst in Turkey they would first need to call the Autoglass ® helpline (00 44 800 36 36 36) for assistance. In the unlikely event Autoglass ® could not assist, they would try to recommend a local reputable firm that could. If a customer’s motorhome windscreen was not repaired or replaced by Autoglass ® but by another company, we would advise them to keep receipts and these would then be sent to Royal & Sun Alliance Insurance Plc who would reimburse reasonable costs.